Whereas clastic sedimentary rocks are dominated by components that have been transported as solid clasts (clay, silt, sand, etc. ), chemical sedimentary rocks are dominated by components that have been transported as ions in solution (Na+, Ca2+, HCO3–, etc.). There is some overlap between the two because almost all clastic sedimentary rocks contain cement formed from dissolved ions, and many chemical sedimentary rocks include some clasts. Since ions can stay in solution for tens of thousands of years (some much longer), and can travel for tens of thousands of kilometres, it is virtually impossible to relate chemical sediments back to their source rocks. The most common chemical sedimentary rock, by far, is limestone. Others include chert, banded iron formation, and a variety of rocks that form when bodies of water evaporate. Biological processes are important in the formation of some chemical sedimentary rocks, especially limestone and chert. For example, limestone is made up almost entirely of fragments of marine organisms that manufacture calcite for their shells and other hard parts, and most chert includes at least some of the silica tests (shells) of tiny marine organisms (such as diatoms and radiolaria). Almost all limestone forms in the oceans, and most of that forms on the shallow continental shelves, especially in tropical regions with coral reefs. Reefs are highly productive ecosystems populated by a wide range of organisms, many of which use calcium and bicarbonate ions in seawater to make carbonate minerals (especially calcite) for their shells and other structures. These include corals, of course, but also green and red algae, urchins, sponges, molluscs, and crustaceans. Especially after they die, but even while they are still alive, these organisms are eroded by waves and currents to produce carbonate fragments that accumulate in the surrounding region, as illustrated in Figure 6.9. 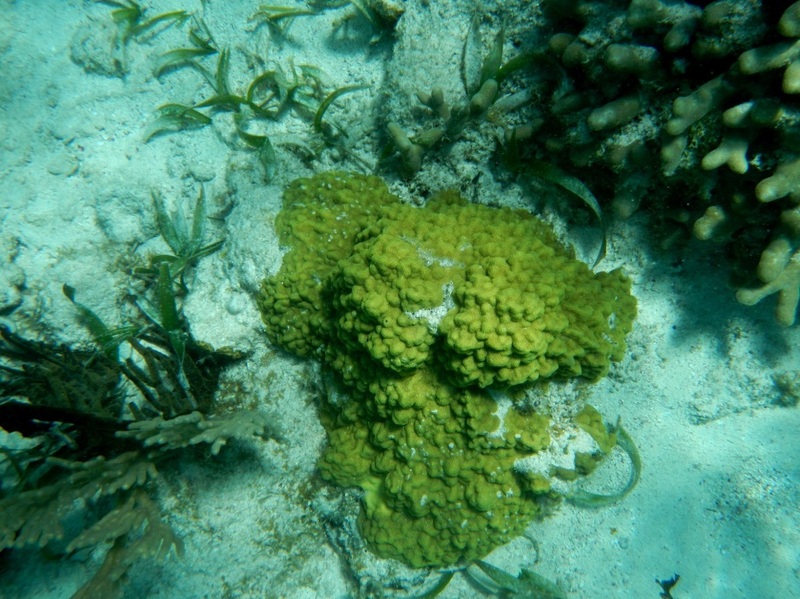 Figure 6.9 Various corals and green algae on a reef at Ambergris, Belize. The light-coloured sand consists of carbonate fragments eroded from the reef organisms. Figure 6.10 shows a cross-section through a typical reef in a tropical environment (normally between 40° N and 40° S). Reefs tend to form near the edges of steep drop-offs because the reef organisms thrive on nutrient-rich upwelling currents. As the reef builds up, it is eroded by waves and currents to produce carbonate sediments that are transported into the steep offshore fore-reef area and the shallower inshore back-reef area. These sediments are dominated by reef-type carbonate fragments of all sizes, including mud. 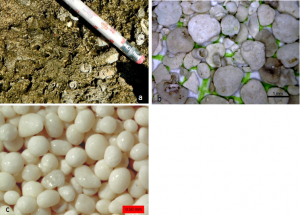 In many such areas, carbonate-rich sediments also accumulate in quiet lagoons, where mud and mollusc-shell fragments predominate (Figure 6.11a) or in offshore areas with strong currents, where either foraminifera tests accumulate (Figure 6.11b) or calcite crystallizes inorganically to form ooids – spheres of calcite that form in shallow tropical ocean water with strong currents (Figure 6.11c). Figure 6.10 Schematic cross-section through a typical tropical reef. 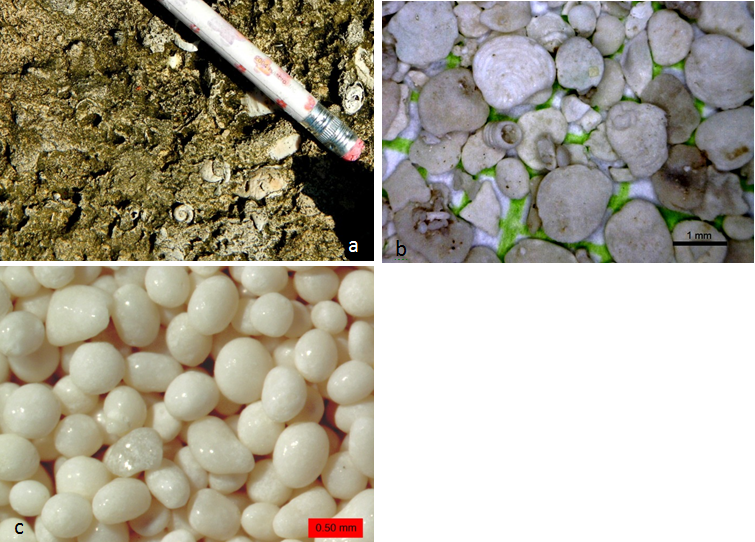 Figure 6.11 Carbonate rocks and sediments: (a) mollusc-rich limestone formed in a lagoon area at Ambergris, Belize, (b) foraminifera-rich sediment from a submerged carbonate sandbar near to Ambergris, Belize (c) ooids from a beach at Joulters Cay, Bahamas. Limestone also accumulates in deeper water, from the steady rain of the carbonate shells of tiny organisms that lived near the ocean surface. The lower limit for limestone accumulation is around 4,000 m. Beneath that depth, calcite is soluble so limestone does not accumulate. Calcite can also form on land in a number of environments. Tufa forms at springs (Figure 6.12) and travertine (which is less porous) forms at hot springs. Similar material precipitates within limestone caves to form stalactites, stalagmites, and a wide range of other speleothems. Figure 6.12 Tufa formed at a spring at Johnston Creek, Alberta. The rock to the left is limestone. Dolomite (CaMg(CO3)2) is another carbonate mineral, but dolomite is also the name for a rock composed of the mineral dolomite (although some geologists use the term dolostone to avoid confusion). Dolomite rock is quite common (there’s a whole Italian mountain range named after it), which is surprising since marine organisms don’t make dolomite. All of the dolomite found in ancient rocks has been formed through magnesium replacing some of the calcium in the calcite in carbonate muds and sands. This process is known as dolomitization, and it is thought to take place where magnesium-rich water percolates through the sediments in carbonate tidal flat environments. As we’ve seen, not all marine organisms make their hard parts out of calcite; some, like radiolaria and diatoms, use silica, and when they die their tiny shells (or tests) settle slowly to the bottom where they accumulate as chert. In some cases, chert is deposited along with limestone in the moderately deep ocean, but the two tend to remain separate, so chert beds within limestone are quite common (Figure 6.13), as are nodules, link the flint nodules of the Cretaceous chalk of southeastern England. 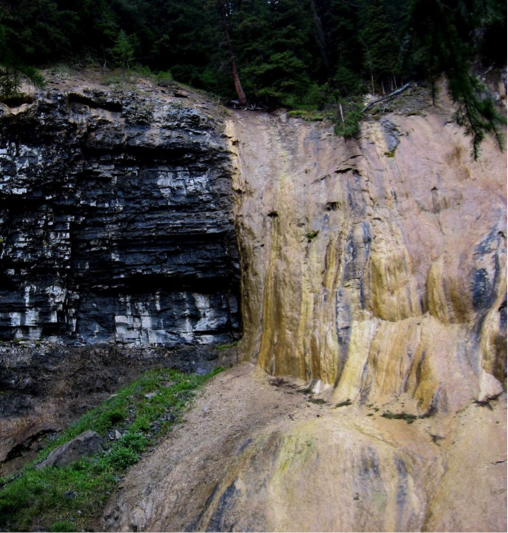 In other situations, and especially in very deep water, chert accumulates on its own, commonly in thin beds. Figure 6.13 Chert (brown layers) interbedded with Triassic Quatsino Fm. limestone on Quadra Island, B.C. All of the layers have been folded, and the chert, being insoluble and harder than limestone, stands out. 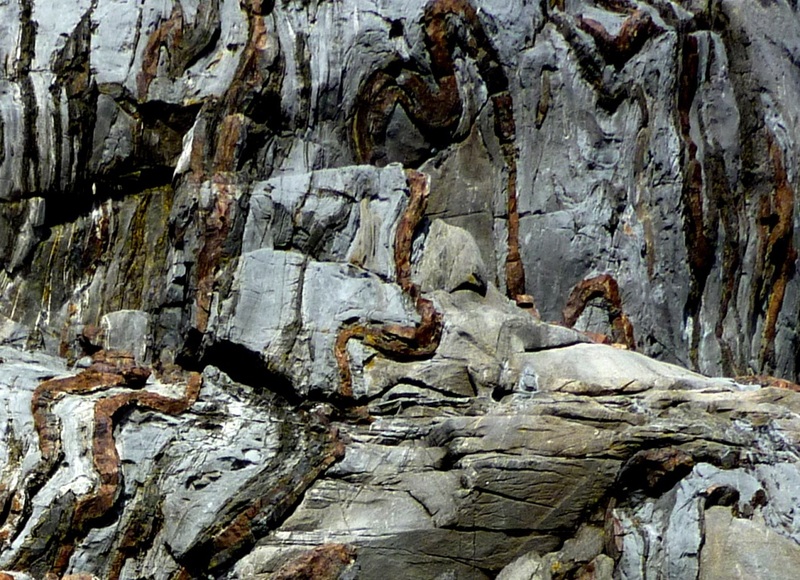 Some ancient chert beds — most dating to between 1800 and 2400 Ma — are also combined with a rock known as banded iron formation (BIF), a deep sea-floor deposit of iron oxide that is a common ore of iron (Figure 6.14). BIF forms when iron dissolved in seawater is oxidized, becomes insoluble, and sinks to the bottom in the same way that silica tests do to form chert. The prevalence of BIF in rocks dating from 2400 to 1800 Ma is due to the changes in the atmosphere and oceans that took place over that time period. Photosynthetic bacteria (i.e., cyanobacteria, a.k.a. blue-green algae) consume carbon dioxide from the atmosphere and use solar energy to convert it to oxygen. These bacteria first evolved around 3500 Ma, and for the next billion years, almost all of that free oxygen was used up by chemical and biological processes, but by 2400 Ma free oxygen levels started to increase in the atmosphere and the oceans. Over a period of 600 million years, that oxygen gradually converted soluble ferrous iron (Fe2+) to insoluble ferric iron (Fe3+), which combined with oxygen to form the mineral hematite (Fe2O3), leading to the accumulation of BIFs. After 1800 Ma, little dissolved iron was left in the oceans and the formation of BIF essentially stopped. In arid regions, lakes and inland seas typically have no stream outlet and the water that flows into them is removed only by evaporation. Under these conditions, the water becomes increasingly concentrated with dissolved salts, and eventually some of these salts reach saturation levels and start to crystallize (Figure 6.15). 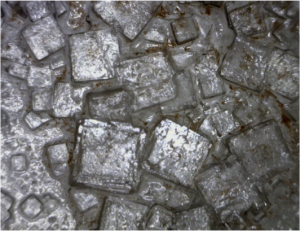 Although all evaporite deposits are unique because of differences in the chemistry of the water, in most cases minor amounts of carbonates start to precipitate when the solution is reduced to about 50% of its original volume. Gypsum (CaSO4·H2O) precipitates at about 20% of the original volume and halite (NaCl) precipitates at 10%. Other important evaporite minerals include sylvite (KCl) and borax (Na2B4O7·10H2O). Sylvite is mined at numerous locations across Saskatchewan (Figure 6.16) from evaporites that were deposited during the Devonian (~385 Ma) when an inland sea occupied much of the region. Figure 6.15 Spotted Lake, near Osoyoos, B.C. This photo was taken in May when the water was relatively fresh because of winter rains. By the end of the summer the surface of this lake is typically fully encrusted with salt deposits. Figure 6.16 A mining machine at the face of potash ore (sylvite) in the Lanigan Mine near Saskatoon, Saskatchewan. 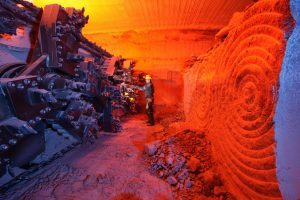 The mineable potash layer is about 3 m thick. This is an easy experiment that you can do at home. Pour about 50 mL (just less than 1/4 cup) of very hot water into a cup and add 2 teaspoons (10 mL) of salt. Stir until all or almost all of the salt has dissolved, then pour the salty water (leaving any undissolved salt behind) into a shallow wide dish or a small plate. Leave it to evaporate for a few days and observe the result. It may look a little like the photo here. These crystals are up to about 3 mm across. JoultersCayOoids By Wilson44691 under Public domain. Dales Goge by Graeme Churchard under CC BY 2.0. 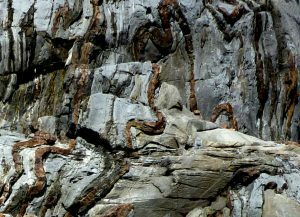 6.2 Chemical Sedimentary Rocks by Steven Earle is licensed under a Creative Commons Attribution 4.0 International License, except where otherwise noted.